(Newser) – Three members of the UCLA men's basketball team were arrested Tuesday in China on suspicion of shoplifting from a Louis Vuitton store next to the team's hotel in Hangzhou, sources tell ESPN. The Bruins are set to open their season against Georgia Tech on Friday in Shanghai. 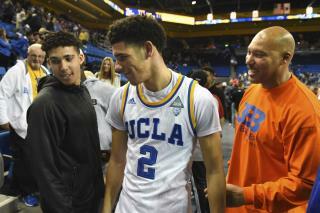 The three arrested players are freshmen Cody Riley, Jalen Hill, and LiAngelo Ball, younger brother of Los Angeles Lakers rookie and second-overall-pick Lonzo Ball. I THINK IT WOULD BE GREAT IF THE CHINESE LOCKED THEM ALL UP FOR AT LEAST TWO YEARS HARD TIME. THEN COME BACK TO THE USA AND DO IT WHERE IT'S OK FOR THOSE "PEOPLE" TO DO THE SAME THING BECAUSE THEY ARE SOOOOOO SPECIAL. JUST ASK 'EM. It would be very stupid of them to do that. Those items are probably fake anyways, not worth it.